A rare opportunity is being offered here in Gilford to help document quilts and quilted items made during the year 1976 and earlier. In addition to quilts, the quilted items may include quilt tops, quilt blocks, quilted clothing and even unfinished pieces. Each item will be measured, photographed, examined and documented by the New Hampshire Documentation Project Phase II (NHQDPII) Team, assisted by knowledgeable volunteers. The team members will analyze and record information including date of the work, fabrics, patterns and condition. A detailed history of information pertaining to each quilted item will be recorded. Participants are encouraged to bring along any photographs, documents or other materials relevant to the quiltmaker and the quilted item. As already stated, all this will happen right here in Gilford Village in the Fellowship Hall of the Gilford Community Church, where there is enough space to set up three documentation table in order to accommodate up to 54 quilts in one day. Thompson-Ames Historical Society will co-host this event along with New Hampshire Documentation Project Phase II. The date set for this event is Saturday, April 30th – but preregistration is required in order for the day to proceed smoothly. Appointments will start at 9:30 a.m. and the last appointment will be at 3:30 p.m.
To make an appointment, all you need to do is telephone the project’s local facilitator, Stephanie Drake, at 524-7419. She will need to know how many quilted items you wish to bring in; three is the limit per person that day. – Quilt owners with 10 or more quilts can schedule a private documentation with NHQDPII. 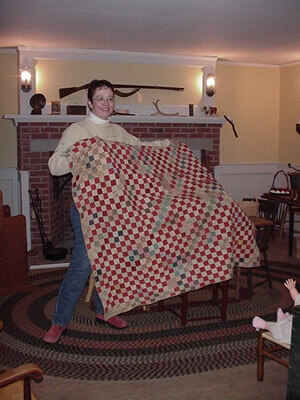 The New Hampshire Quilt Documentation Project II is a non-profit organization dedicated to the identification and preservation of historic quilts and quilted textiles in New Hampshire. It is the Project’s goal to increase public awareness and appreciation of the significance of quilts in the lives of their makers, and as part of our cultural and artistic heritage. Preservation of vintage textiles, always a concern, is also addressed by NHQDPII. Information on the care and storage of quilted items will be made available at Gilford Community Church on Gilford’s Quilt Documentation Day..
That day quilts will be documented free of charge. Documentation will include a photograph of each quilted item. This information eventually will be compiled in book format. If an owner requests a copy of the documentation and a photograph, the fee for this service is $5 each. These fees help defray the costs of copying, photographs, supplies, printing, etc. -- NHQDPII, a non-profit volunteer organization, is also funded through contributions and grants. Quilt appraisals are also available through NHQDPII. There are three types of appraisal: Insurance, Fair Market Value, and Donation. Most people want to know what their quilt is worth. If they are selling a quilt, that value is Fair Market Value. If they want to know what it would cost to replace the quilt, that value is Insurance. Normally Insurance and Fair Market Value are the same. Donation and Fair Market Value are always the same and must be accomplished within 60 days of the donation. Fees vary amongst appraisers but usually run between $35 and $45. This documentation opportunity is especially meaningful to Thompson-Ames Historical Society, for included in T-AHS’s collections are more than 20 vintage quilts. The expertise of this NHQDPII Team is a wonderful resource to our collections management! If there is more than enough interest in the opportunities that Gilford’s Quilt Documentation Day offers, feel sure that the resources of New Hampshire Quilt Documentation Project Phase II will again be made available to the public in “our neck of the woods”, as Old Timers used to say. This is one of many events scheduled by Thompson-Ames Historical Society for the year 2005.—Don’t forget the “Homestead Open House” slated to happen Saturday morning, March 30! This year’s schedule of T-AHS Programs will be distributed soon and will also be posted on the website: www.gilfordhistoricalsociety.org, so do remember to check out the website regularly.